What is this, Drudge Report? "Season-killing loss?" Are you kidding me? 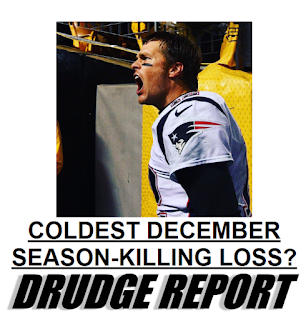 "Season-killing loss?" They have a two-game lead over the Dolphins! The Patriots would need to lose their next two games, and have the Dolphins win out, for their season to be in jeopardy. (And that doesn't even account for tie-breaking scenarios.) Get back to me when it's Week 17. Then you can talk about a season-killing loss. And, yeah, I realize the line about a "potentially season-killing loss" originated from a Boston Globe article, but I'll cut them some slack since it wasn't their actual headline. 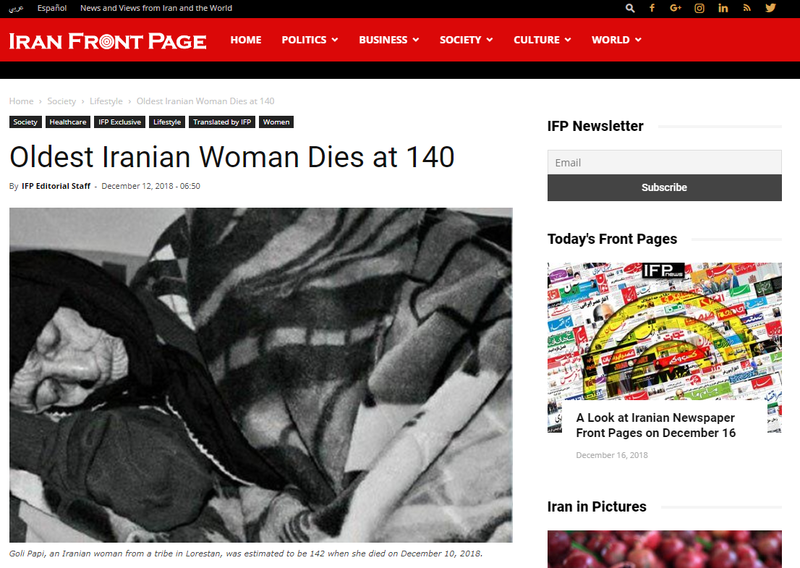 The story claimed that the oldest woman in Iran, Goli Papi, had passed away at the age of 140. An Iranian genealogist, Morad Hossein Papi, was quoted as saying: “The late woman was from a tribe called Papi residing in Silakhor Plain in Dorud County.” I did some Google searches and couldn't find any other prominent mentions of Goli Papi or Morad Hossein Papi. Recently, Reuters published a report about Iranian disinformation sites, and I don't think IFPNews.com was part of their scope. After reviewing some of the other stories on IFPNews.com, I don't feel like it's a typical disinformation site. A lot of their stories seem to fall into the Taboola category: There's one article about stem cells, another article about minimally-invasive spinal surgery, etc... IFPNews.com may just be a typical blog that happens to be based in Iran. It could still be worth documenting, however. According to Whoisology, IFPNews.com is registered to Mahmood Askarieh and the organization Safhe ye Avval. The administrative e-mail is mahmoodaskarieh@gmail.com. The contact address is no 26, pirjamali Alley, Shariati Ave. Piche Shemiran, Tehran. The zip code is listed as 1611943715, and the country is listed as "Afghanistan." The contact phone number is 982177528888, and the contact fax number is 982177535454. For years, Breaking911.com used the Twitter handle @Breaking911. 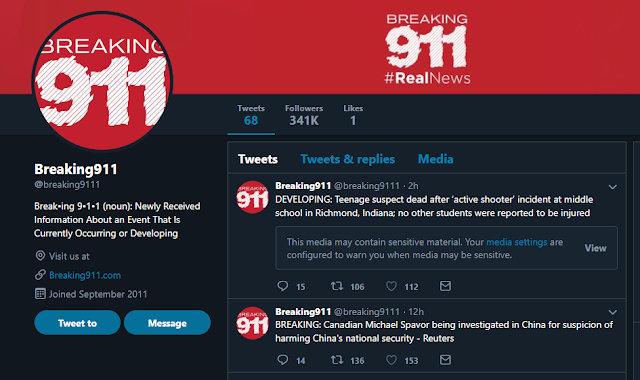 Currently, Breaking911 is using the Twitter handle @Breaking9111. I don't know why they switched. 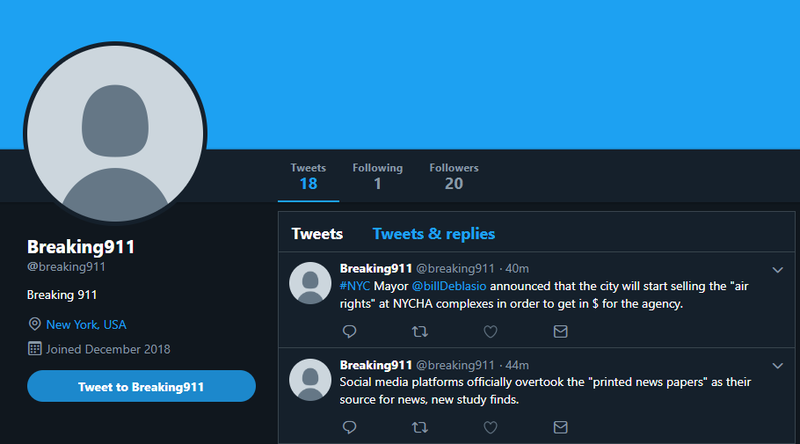 There's actually a new Twitter account with the handle @Breaking911 (created on December 6), and lately it's been writing tweets that kind of sound like breaking news blurbs. However, neither the profile nor the tweets themselves contain any hyperlinks to Breaking911.com. That account has 20 followers. 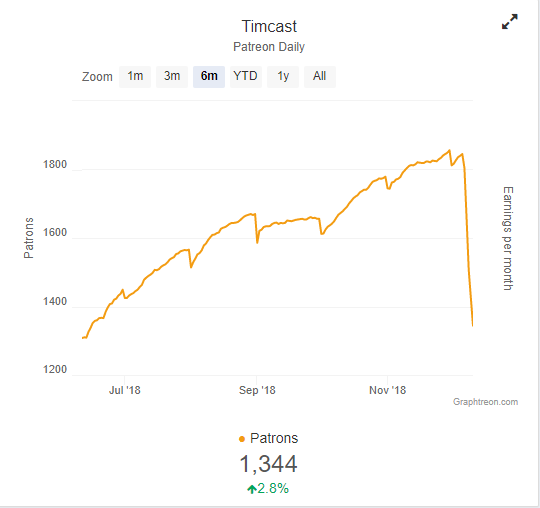 The reason for the nosedive is that many of Tim Pool's supporters have recently switched from Patreon to SubscribeStar. This migration was prompted by Patreon's decision last week to boot Sargon of Akkad from their platform. Sargon set up a SubscribeStar page, and he already has 1,531 subscribers. Tim Pool, meanwhile, has 534 subscribers on SubscribeStar, which is roughly equal to the amount of subscribers he's "lost" on Patreon. This post on Breaking911.com is really stupid. It's titled: "SHOCK VIDEO: This move on the apron during WarGames left fans stunned." The two "shocked" girls in the image are part of the performance. In storyline, they're friends with Shayna Baszler (the girl who received the DDT), which is why they've got the shocked looks on their faces. They're acting. As far as I can tell, the DDT was performed perfectly and nobody was hurt. I wonder if he's famous enough nowadays to be referred to by name? He is up to 300,000 Twitter followers. Which subreddits reach the top of /r/all? 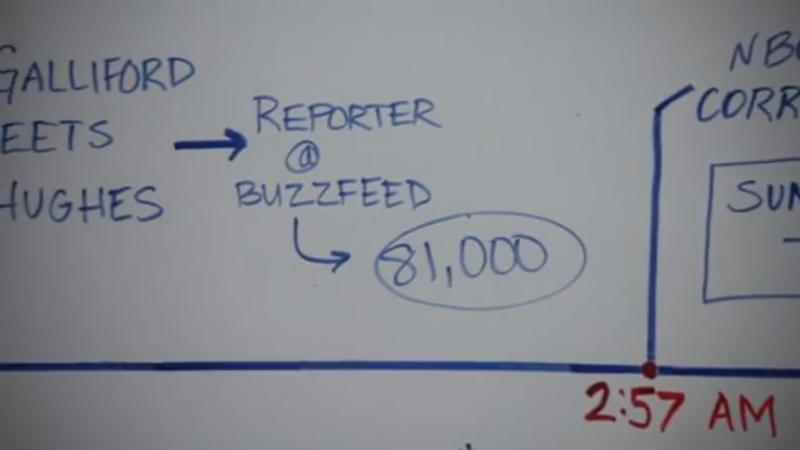 Have you ever wondered which subreddits have the most success reaching the #1 spot of /r/all? Fortunately, there's a bot, /u/TopRedditBot, that records a thread whenever it reaches the #spot of /r/all. These threads are cross-posted over in /r/TopOfReddit. I went to /r/TopOfReddit yesterday and sorted by "New," then I scrolled until I could see the 1,000 most-recent threads (the earliest thread was from October 22), and noted how many times each subreddit was represented. To my non-shock, /r/Politics had the most success reaching the top of /r/all. Then came /r/Funny, /r/Pics, /r/Gaming, /r/Gifs, /r/Aww, and /r/TodayILearned. For the record, I don't think /u/TopRedditBot is 100% accurate. Sometimes is seemed to record the same thread multiple times, and at other times it failed to record a thread that I could see with my own eye had reached the #1 spot of /r/all. But in general it's pretty good.